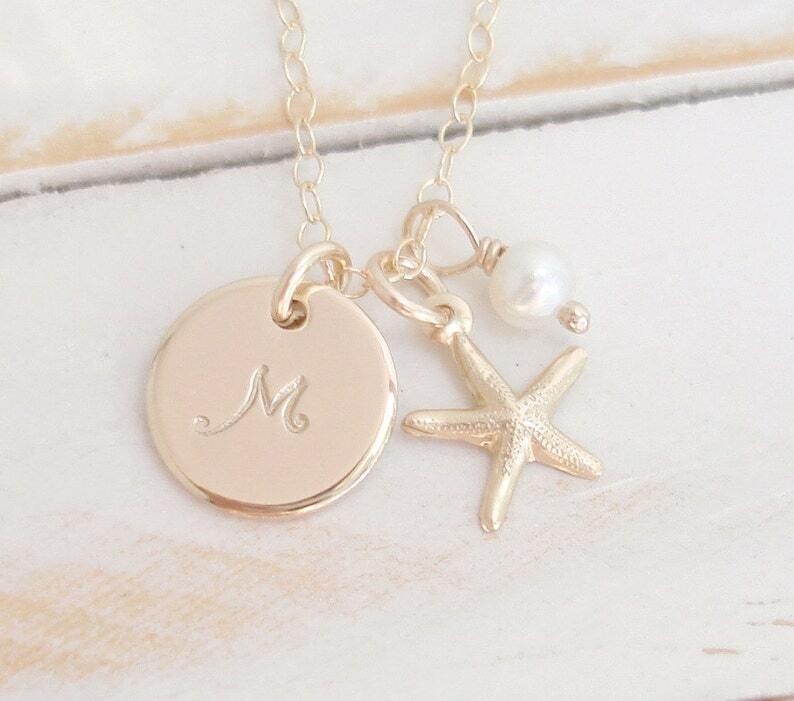 Tiny Gold Starfish teamed up with a Custom made initial disc and tiny pearl! 14k Gold Filled 3/8ths inch diameter, thick 20 gauge disc, you choose font and initial! Comes boxed with a bow. U.S. shipping includes tracking and delivery confirmation. Perfect dainty necklace. Great quality and beautiful. Shop owner also very helpful with shipping. I bought this as a graduation gift for my boyfriends sister. She loved it! The 16 inch length layered perfectly with other necklaces she owned and the hammered texture had a unique look that stood out from the others! I accept PAYPAL, Visa, Mastercard, Discover, American Express, all Credit/Debit Cards. At check out, in Paypal, you will have the option to pay with Paypal or to checkout as a guest. If you wish to not use paypal - please select "checkout as a guest" - then next screen will allow you to use all other forms of payment (credit or debit cards). Please contact me if any questions - thank you! I hope you will love your new jewelry! If you are not happy with your item(s) or if they arrive damaged, please notify me within 5 days of receiving item, so I may help you asap. (Send message Thru ETSY please to insure I receive). Exchanges or returns are handled on a case by case basis ~ ultimately I want you to be happy with your purchase! *CUSTOM ORDERS: Due to the personal nature of Custom orders - they are not returnable/refundable. (Unless I have made a mistake on item). *International orders - Due to Custom's Fee's I'm not able to take returns on International orders. In order to process a exchange/return I must receive items back in same condition as you received (unworn-no exceptions) also in the original packaging please. Items need to be mailed back to me within 7 days. After 7 days, all sales will be final. Buyer will be responsible to pay shipping fees to return item to me. If a returned item gets lost in the mail, I will not be responsible for the value of the lost item. To avoid any loss you can opt to insure the item when posting back to me. *Also - refund amount is for Purchase Price only as original shipping fee's are paid to post office and are NOT refundable. ♥US orders ship First Class and take 2-5 days on average, can take longer. Priority shipping available at checkout for faster shipping. ♥INTERNATIONAL orders take 2-4 WEEKS on average, can take longer due to Customs department, flight delays or weather delays. ♥INTERNATIONAL CUSTOMERS - please be aware of your country's tax and duty fees - as I have no way to know what they are. Up to you, as buyer, to be aware of these fees before purchasing as I do not pay these fees - per Customs Laws. *IMPORTANT*~ I will SHIP your item(s) to ADDRESS on receipt that you provide at checkout - please make sure this is ACCURATE before you checkout - thank you! ~Once payment is received, I will start your order. Items are HANDMADE TO ORDER and take a minimum of 3-5 business days (Bridal 7-10 business days) to make. Business days are Monday thru Friday - and I will sometimes ship on Saturday in busier holidays. ~I ship USPS First Class on all packages unless otherwise stated. ♥Please understand I will make every effort to get your item out as fast as possible, however - once it has shipped it is in the hands of the POST OFFICE - so shipping times may vary. *Please contact me if you wish to pay for another shipping service such as Priority, Express, or Registered and I will check cost for you to your area. Please message me through Etsy if you have any questions. I work hard to make my jewelry with the best quality in mind. In my designs, I incorporate many natural stones which are sometimes subject to a natural flaw or inclusion. Even though I strive to purchase gems that are AA-AAA grade, please remember these are "natural" which translates to "unique" and "beautiful". A good portion of my gems, I purchase right here on Etsy so I can say "I'm a proud supporter of the Etsy community! "